This book examines the tension between the need for food, or food security, and the desire to maintain sovereignty over food production, in this case seeds for agricultural production, or seed sovereignty. The need for food is increasingly being met by a greater reliance on uniform commercially bred seed, including genetically modified seeds designed by multinational corporations and supported by philanthropic organisations such as the Gates Foundation. However, meeting the need for food in this way risks eliminating the sovereignty of domestic producers. These are the local farmers and farming communities who wish to continue freely cultivating the seeds of their choice. This chapter introduces the issues at stake in the tension between food security and food sovereignty. ACB. 2015. The expansion of the commercial seed sector in sub-Saharan Africa: major players, key issues and trends [Online]. Available from: www.acbio.org.za. [Accessed 3rd February 2016]. AFSA and GRAIN. 2015. Land and seed laws under attack, who is pushing changes in Africa? [Online]. Available from: http://www.grain.org [Accessed 22nd January 2016]. De Schutter, O. 2009. Seed policies and the right to food: enhancing agrobiodiversity and encouraging innovation report of the Special Rapporteur. A/64/170 United Nations General Assembly [Online]. Available from: http://farmersrights.org/pdf/righttofood-n0942473.pdf. [Accessed 23rd February 2013]. ETC (Erosion, Technology and Concentration Group). 2010. Capturing climate genes. Gene giants stockpile ‘climate-ready’ patents [Online]. Available from: http://www.etcgroup.org/content/gene-giants-stockpile-patents-“climate-ready”-crops-bid-become-biomassters-0. [Accessed 1st February 2012]. Ethiopian Census. 2007. Census-2007 Report. Addis Ababa: Central Statistical Agency. Available at: http://www.csa.gov.et/census-report/complete-report/census-2007. Accessed 14 March 2019. GRAIN. 2005. Africa’s seed laws: red carpet for the corporations [Online]. 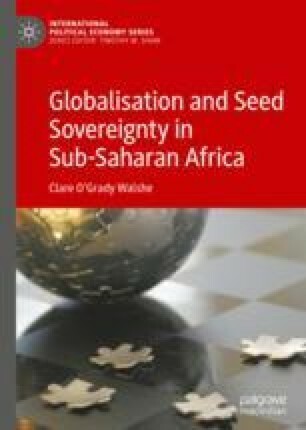 Available from: https://www.grain.org/article/entries/540-africa-s-seeds-laws-red-carpet-for-corporations. [Accessed 11th November 2014]. IPCC. 2014. Climate change 2014: synthesis report, contribution of working groups I, II and III to the fifth assessment report of the Intergovernmental Panel on Climate Change [Online]. Available from: http://ipcc.ch/pdf/assessment-report/ar5/syr/AR5_SYR_FINAL_SPM.pdf. [Accessed 30th March 2017]. Kloppenburg, J. 2008. Seeds, sovereignty, and the Via Campesina. Plants, Property, and the Promise of Open Source Biology [Online]. Available from: https://www.researchgate.net/publication/255583305_Seeds_Sovereignty_and_the_Via_Campesina_Plants_Property_and_the_Promise_of_Open_Source_Biology. [Accessed 10th April 2017]. Moseley, W.G. 2012. The corporate take-over of African food security. Pambazuka News [Online]. Available from: www.pambazuka.org/food-health/corporate-take-over-african-food-security. [Accessed 21st September 2013]. Nyéléni Declaration. 2007. Nyéléni 2007. Forum for food sovereignty. Sélingué, Mali, February 23–27, 2007. Available at: https://nyeleni.org/DOWNLOADS/Nyelni_EN.pdf. Accessed 14 March 2019. Shiva, V. 2013. The law of the seed. [Online]. Available from: http://www.navdanya.org/attachments/Latest_Publications4.pdf. [Accessed 2nd April 2015]. UNDP. 2008. Human development report 2007/08. Fighting climate change: Human solidarity in a divided world [Online]. Available from: http://hdr.undp.org/en/content/human-development-report-20078. [Accessed 10th April 2017]. UN International Declaration of Peasants’ Rights. 2012. Final study on the advancement of the rights of peasants and other people working in rural areas. Geneva: United Nation A/HRC/AC/8/6. Available at: http://www.wphna.org/htdocs/downloadsfeb2013/2012%20Declaration%20of%20Peasants%27%20Rights.pdf. Accessed 14 March 2019.